Established by John Reyes and Brendan Brader in 1999, HostRocket has its headquarters in Clifton Park, New York. From there, it operates its own data facility. The hosting firm offers a broad selection of hosting services, and presently has over fifty-thousand customers. 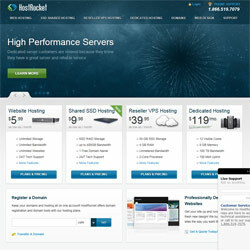 This HostRocket review will take a closer look at the merits, or otherwise, of this hosting provider. HostRocket has several hosting packages, including reseller, shared, cloud VPS and dedicated packages, however many of these are provided by a different firm. For instance, reseller cloud hosting and standard cloud hosting are provided by the firm DotBlock. These packages are sold in groups, on a progressive price scale. Each package includes SSD storage, unmetered bandwidth, a three GHz processor and three GB RAM. Customers who opt for cloud hosting are asked to contact DotBlock directly. The shared hosting is divided into four and seems to be based on Linux. There is little variation in service capability between packages, however long term contracts have lower prices. This method of selling shared hosting is notable, in that it offers every customer unrestricted resources, and only alters the price if longer contracts are taken. Biannual and annual packages feature complimentary setup and no charge for a specified time period (for new customers only). SSL certificates, dedicated IPs, domain transfers, backups and registrations are all billable extras, however the basic packages remain as they are — so the shared hosting is fairly straightforward. Dedicated hosting packages are divided into tiers, based on the storage, RAM and cores you need. Apart from the basic package, all come with complimentary RAID10. Performing a dedicated server reboot is easy; you only have to click an icon on the relevant support webpage. HostRocket’s pricing is not as competitive as some other leading web hosts, and its customer support is reportedly below par — with poor expertise and delayed response times. Nonetheless, the firm does provide a big app library, which can be installed easily and quickly. Also, its standard service plans feature unrestricted disk space, bandwidth, databases and email accounts. HostRocket provides a web design service, which might be suitable for SMEs wanting a customized, professional online presence. Included in the cheapest web design package is one customized webpage and a personal consultation. eCommerce platform installation is included in the most costly package. The websites offered are modern, sharp and appealing. Website creation tools are available from HostRocket; however they are far too pricey for the majority of budding online entrepreneurs. The firm should give customers the ability to produce their own websites. As things stand, customers have to depend on HostRocket to carry out the work for them. HostRocket claims 99.5 percent uptime for shared and dedicated hosting packages and the support section states that accounts might be credited, if websites are offline more frequently than this. Notwithstanding, customers have to apply for account credits. There are no published details about downtime or uptime. Moreover, 99.5 percent is a bit less than several other similarly priced web hosts. The firm says that its New York data facility has sufficient space to allow it to double its capacity. Therefore, it would seem that HostRocket is not planning to move any time soon. Connections are provided via Time Warner’s Cisco routers, category 5E ethernet cabling and fiber network. The premises are air conditioned and have diesel generators, along with complete UPS battery reserve power. The premises are staffed 24/7, seven days per week, as you would expect. As far as backups go, customers have to carry out backups themselves through their Cpanel. Apart from this, no details about normal backups are mentioned. Select HostRocket if the websites it offers appeal to you, and you can afford the price tag. If you have a site already, or intend to build one yourself, HostRocket might not be the best firm to use. The unrestricted bandwidth, disk space, database and email accounts are welcome additions; however there are numerous other web hosts that can provide this for a cheaper price.